Not to be overshadowed by the Apple launch event, Microsoft has sent out its own invites to the media today for a New York City event on Sept. 23. Microsoft is expected to announce its next-gen Surface Pro and Surface RT tablets, the purportedly named Surface Pro 2 and Surface 2, the latter of which has most likely dropped the "RT." Both have seen numerous leaks lately with the Surface Pro 2 rumored to be Haswell-based and the Surface 2, Tegra-based. The Surface Pro 2 is also supposed to truly replace PCs by providing the Surface Dock, an accessory that allows more device connections, along with a Power Cover to supply extra battery juice. 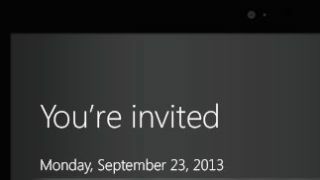 The Surface tablets will most likely see an October 2013 launch. Windows 8.1 will be available to existing Windows 8 users for free in an update Oct. 17, and available the next day to buy meaning October is the month for Microsoft. Tune back in Sept. 23 to find out for sure from TechRadar. Not sure if you'll like Windows 8.1? Check out our review to see what it's packing!